I once thought that rubbing the extract of the humble papaw into one's skin to alleviate the symptoms of chafing, burns and insect bites was a curious practice. Then I found out that some people are prepared to inject a deadly poison straight into their face in order to smooth out wrinkles. I'll take the papaw any time thanks! And I'm not the only one, it seems - actors, celebrities and models all over the world are praising its healing properties and rejuvenation qualities - Google it and see. Apparently it has no peer as a lip balm. Lucas' Papaw Ointment can be found at chemists and it comes in tubs as well as tubes that look like this. This natural remedy has a history that dates back over 100 years, and it originated right here in Brisbane. 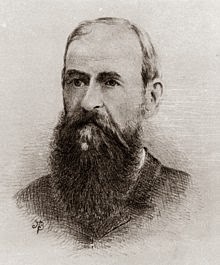 Its discoverer was a doctor with an interest in botany, Dr Thomas Pennington Lucas, who was born in Scotland, educated in England, practised in Herefordshire and then Melbourne, and came to Brisbane in the mid-1880s for the warmer climate. Here he practised medicine and studied thousands of tropical plants, seeking natural remedies for disease. His medical practice was initially located in central Brisbane and then moved to South Brisbane near to where the Mater Hospital now stands. In 1890 he purchased a 16 ha (about 40 acres) farm at Acacia Ridge so that he could plant and grow specimens for experimentation. The family moved to the farm and Lucas moved his medical practice back to Adelaide St in the city. By this time his interest in papaws had led him to call the fruit "the world's greatest healing agent". This photograph shows an early advertisement for his papaw ointment. The building to which it is attached may have been on Lucas' property at Acacia Ridge but I cannot be sure. The initial success of the papaw ointment and his own conviction that it was a medical marvel led Dr Lucas set up the Vera Papaw Hospital in suburban New Farm in 1911 - it no longer exists, having been superseded by a block of units. A drawing of Vera is now shown on every package of the ointment. The Brisbane Courier of 8 December 1911 carried the following item, and below that is a photograph of Vera Papaw Hospital. 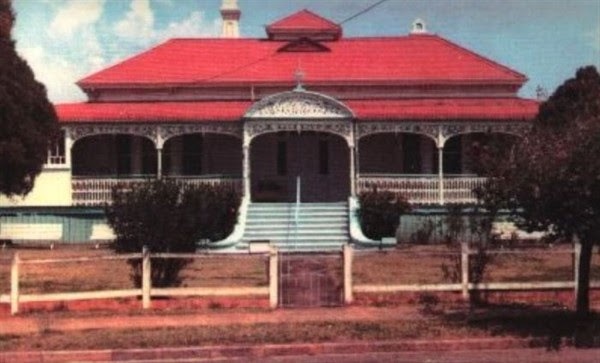 Dr. T. P. Lucas has purchased Vera, the fine residence at the corner of Moray and Sydney streets, New Farm, adjoining Sir Samuel Griffith's former residence, and is converting it into a sanitorium to be known a the Papaw Sanitorium, where in future he will carry on his practice and also receive patients for special treatment. Dr Thomas Pennington Lucas died on 15 November 1917, leaving the recipes for all his medical treatments to his wife. In 1919 she sold the business and the hospital in New Farm was sold in 1921. The ointment operation was bought by Lucas' daughter-in-law and then it passed to his granddaughter whose family still operates the business today at a site in Acacia Ridge that is quite near the original Lucas farm. However that is not the whole TP Lucas story. The first-ever published book that was set in Brisbane was entitled The Curse and its Cure, and it was written by none other than Dr Thomas Pennington Lucas who also wrote a number of other books, both fiction and non-fiction. As ever, an interesting read. Glad to see you back and I hope things are going as well as can be expected. I had no idea! Thanks for another informative andiinteresting read. I think it was inevitable that the cure for tropical or semi tropical medical conditions (chafing, burns and insect bites) was going to be found in tropical or semi tropical regions of Australia. But what a clever and persistent chap Lucas was. I presume he funded the farm, and grew and studied thousands of tropical plants himself. Today it would take a multi-national drug company. It seems that he persevered for many years when others thought him a crackpot. Good to see such success and that it is still a Brisbane business.